It has been over twenty years since I was in school and had summer vacation. Yet, living in Jerusalem, summertime is still a very different season and marks a transition in time. Each summer the transient population of the city changes. There are students who come and go for the year and families who are on sabbatical. The city’s beat accelerates with waves of tourists who populate the city in the summer and there is no shortage of activities and special events. Many Jerusalemites host visitors from overseas in this season and we are no exception. Having come of age when our eldest is now a Bar Mitzvah, many of our American friends are planning trips with their families. Sometimes they are coming to celebrate a bar or bat mitzvah and we join them at the Western Wall. Others simply realize that it has been too long since they visited the Jewish homeland and they want their children to experience a family trip to explore their heritage together before another year passes and their children are that much older and independent. Like when I lived in Manhattan, tourists provide me with the opportunity to visit places I do not usually go and to see my surroundings from a different perspective. This summer I was able to reconnect with a friend of mine from USY as he and his family came to Israel to visit. 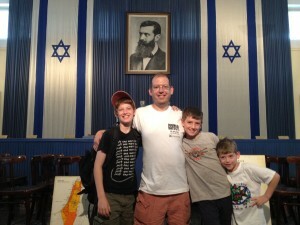 David Kritz, a native of Cherry Hill who now lives in Bridgewater, visited Israel with his wife and two sons. My family joined them for a day of touring in Tel Aviv and then hosted them for Shabbat in Jerusalem. For several years I had heard of the new Palmach Museum in Tel Aviv and Dave’s visit provided us with an opportunity to pay it a visit. Unlike most museums, the Palmach Museum is experiential and was created by those it seeks to honor and commemorate. As you walk from room to room you participate in a multimedia presentation following a core group of teenagers as they are transformed from unskilled volunteers meeting in a forest to trained military specialists with several years of experience leading the Israel Defense Forces against the Arab attacks during the War of Independence. Intermixed with movies of actual events, actors’ lifesize images are broadcasted around you in rooms that feel more like forests, deserts and ships than a building. By the time the experience finished, not only had I learned more of the history of my country than I had previously known, but I felt like I had participated in it. It is hard to believe that these events took place a little over sixty years ago. Today the trip from Tel Aviv to Jerusalem only takes 45 minutes and a highway transports thousands of travellers everyday. At the time of the War of Independence, Jerusalem was cut off from the rest of the country, food and water were rationed and each convoy that tried to reach Jerusalem’s population risked their lives passing through a valley vulnerable to Arab attacks from the mountains on either side. The remnants of these convoys are still visible on the highway as a memorial to those who gave their lives so that we could live ours in the modern Jewish State. After all these years of living in Israel, I am still in awe that the fighting force made up of so few, with hardly any resources managed to defend themselves in 1948 against so many invading armies. And though it was only a few decades ago, it seems a world away from Israel’s modern reality. It is easy to forget and to get absorbed in our day to day lives. We worry about work, about our family, about all the issues that consume us and lose perspective that we are living in a modern day miracle. After visiting the Palmach Museum we went to Independence Hall in downtown Tel Aviv. Having just come from a reenactment of the fight for independence and having listened to the broadcast of the UN vote, country by country, with Israel’s very existence hanging in the balance, being in the hall where David Ben Gurion proclaimed Israel’s independence had special meaning. On the way to Independence Hall, our car stopped. It died two blocks away from Independence Hall. The battery was dead. My wife waited while I took our three sons on the tour. The tow truck came to tow it back to Jerusalem and afterwards my wife joined us for lunch. We took the bus back to Jerusalem, having had quite an adventure, but nothing compared to those who fought for Independence and travelled by foot for days throughout the country. Sometimes it seems that life is very hard. For those of us who make aliyah, at some point everyone questions their decision. Why did I chose to do this? Why am I making my life so difficult? 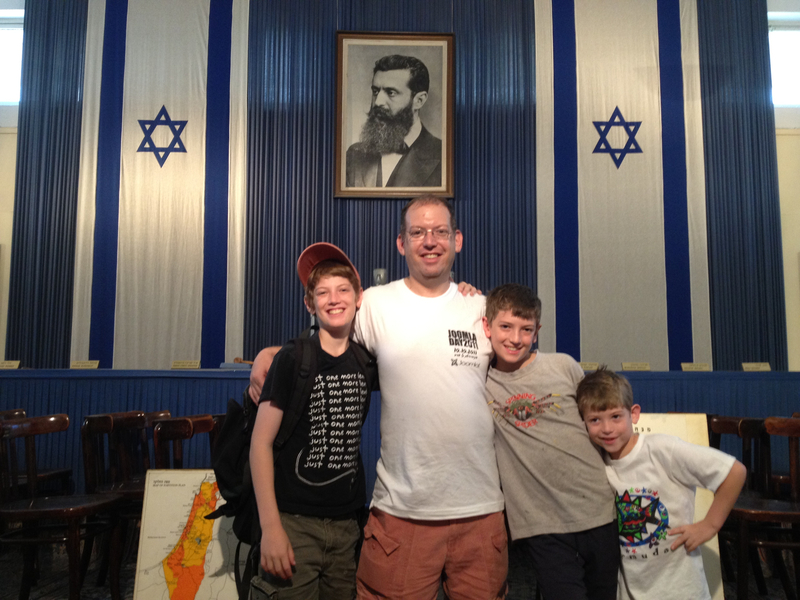 I had my picture taken with my Israeli-born sons in that famous room where Ben Gurion had stood and where the Jewish State was born. Sitting on the bus back to Jerusalem I showed my wife the photo of us with Herzl’s portrait and the Israeli flags hanging in the background and she said, “That’s why you’ve made your life so hard.” And with her words, it all seemed worth it. This entry was posted in Author's Favorites, Home in Jerusalem, Israel-Diaspora Relations, Parenting, Published in The Jewish Community Voice of Southern NJ, War, Peace and Terrorism and tagged Aliyah, American Jews, education, Independence Day, Israel Defense Forces, israeli defense forces, New Jersey, Tel Aviv, tourism on August 21, 2012 by charlie.